We believe that student attire affects the learning environment of the school campus. Burton Technology College-Ready Academy relies upon the good judgment and taste of both students and families with respect to grooming and appearance. Cleanliness, neatness, and due regard for the legitimate sensibility of other constitutes the basic goals and norms of the school. The following uniform requirements apply to all students of Burton Technology College-Ready Academy High School. In the 2017 – 2018 school year, each grade level will be wearing a different color of shirt; the colors will be shades of grey. 9th grade will be in ash grey. 10th grade will be in sport grey. The 11th grade in charcoal grey and 12th graders will be in Black. Students will only be able to purchase uniform shirts if they earned the proper number of credits to be in that grade level. 10th grade students will need 55 credits. 11th grade students will need 110 credits. 12th grade students will need 165 credits. In order to be in compliance with the Alliance Uniform Policy, the only sweatshirts, jackets, sport coats/blazer, sweaters and vest students will be able to wear must be BLACK, GRAY or WHITE, cannot have ANY visible logo and must a solid color (no lettering, logos, or branding) and NO HOOD. Students will not be able to wear their own outerwear for the 2017 - 2018 school year if it does not adhere to the uniform guidelines. In addition, all accessories including but not limited to ties, socks, belts, t-shirts, shoelaces, and shoes must be black, white, grey or any combination of the three colors. Students at each Alliance campus must adhere to a strict uniform policy. 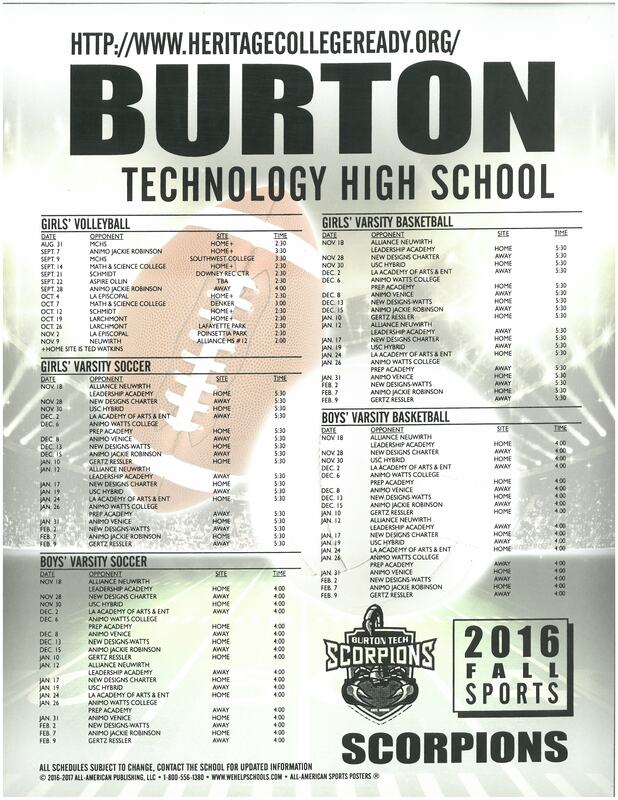 Tops: Every Student must wear a short sleeve or long sleeve Burton Tech logo dress or polo shirt. Tucked in Shirts: All uniform shirts will be tucked in for the entire day, while on school grounds and/or school activities. Skirts & Shorts: If wearing skirts or shorts, they must not be cargo, and must be knee-length. Clothing Size: Uniform items, including pants and shirts, should not be tightly fitted or no larger than one size of the student’s regular clothing size. Footwear: Black, white or gray dress shoes or tennis shoes. All footwear must have closed toes and heel straps. No house shoes, slippers, or sandals of any kind are allowed. Accessories: Head/hair wear such as ribbons, headbands, and clips must be black, white or gray. Spirit Shirts: T-shirts bearing the school crest, any college or university t-shirt. Parents will be contacted immediately when their student is not adhering to the uniform policy described above. If a student is out of uniform, parents will be asked to bring the student a change of clothes before the student may return to class. Students are expected to be responsible for coming to school in uniform prepared to learn and to check their own attire. Please be aware that, any staff can conduct uniform checks. Students who are not in compliance with the uniform policy will be dealt with on an individual basis by the administration. All students whose attire is in violation of Dress Code policy face disciplinary action and depending on the severity of the violation, students may not be permitted to return to class until they have changed. 1. Students are permitted to wear casual pants, including clean and un-torn or frayed jeans. 2. Students are permitted to wear t-shirts, sweatshirts or other casual shirts/blouses provided they are modest and do not make reference to drugs, alcoholic beverages, taverns, offensive activities or sexual content, etc. “Double meaning” T-shirts are not permitted. 3. Bare midriffs and clothing that is sexually suggestive or fails to conceal undergarments, back, abdomen, and cleavage will not be allowed. This includes, but is not limited to, cut-out shirts, halter tops, short shorts/skirts, bathing suits, tank tops, low-cut tops/dresses, or muscle shirts. 4. Gang attire of any kind is not allowed. This includes gang-related clothing, solid colors of red or blue clothing or accessories, including but not limited to bandannas, or other symbols, emblems, or insignia are prohibited. Gang-related web belts with or without punched out metal buckles are prohibited. Dangerous clothing accessories are prohibited (i.e., spiked jewelry, studded collars, studded belts). 5. Students may wear casual pants, skirts, shorts and skorts and appropriate blouses. Skirts and skorts must be the appropriate size and must be knee-length. 6. Sandals are not permitted. 7. Hats are not to be worn during any school time. 8. Any student, who has doubt about what to wear, should simply not wear it.